At the Trialogue CSI Forum, presented in partnership with Volkswagen South Africa (VWSA) in November 2018, companies and literacy-focused NPOs discussed the type of support that is required to ensure effective early stage literacy interventions. Findings from the Progress in International Reading Literacy Study 2016 (PIRLS) sent shock waves through the country when it was reported that a staggering 84% of children in South Africa could not read for meaning in any language and that the country was ranked 133 out of 144 countries for the quality of its primary school education. According to non-profit organisation (NPO) help2read, by the age of three children from low income households hear 30 million words fewer words than their wealthier counterparts. Despite education receiving significant government and corporate investment each year, a Stellenbosch University study found that illiteracy costs the country R450 billion a year. Corporate commitment to improving the quality of education in South Africa is evident in Trialogue’s findings that over 90% of companies support education programmes, and nearly half of corporate social investment (CSI) consistently goes to the education sector. 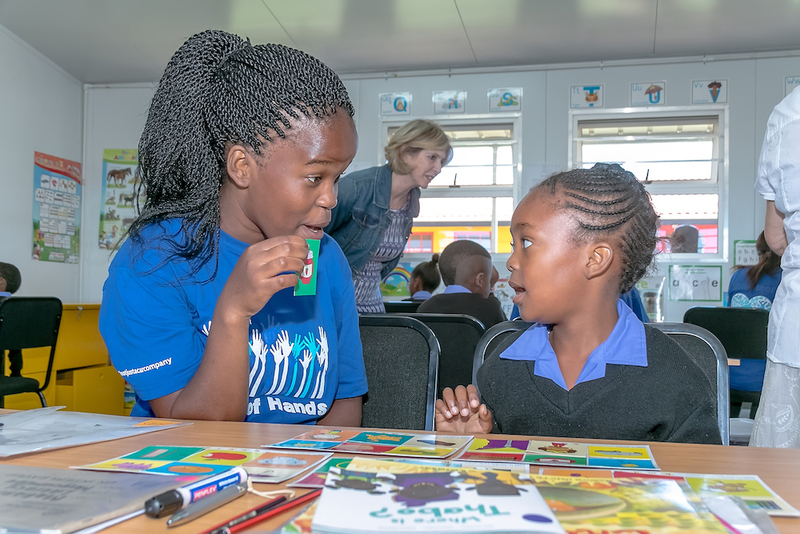 Of the 44% of total CSI expenditure that was directed to the education sector in 2018, 30% went to maths and science, with just 10% invested in language and literacy. 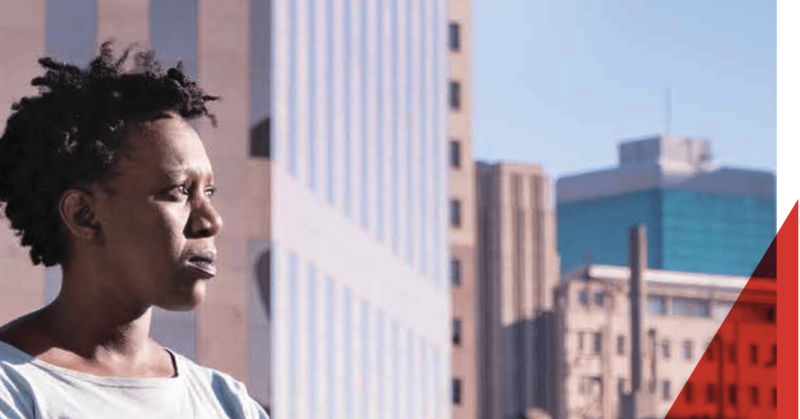 In terms of levels of education, the majority of CSI spend on education (57%) went to tertiary and further education and training, with just 18% going to early childhood development. Companies often prioritise the funding of higher education since the return on investment can be more immediately measurable, directly attributable and can also possibly benefit the company employee pipeline, while early-stage education interventions are long-term investments. Forum delegates agreed that the private sector and NPOs have the ability and responsibility to pioneer and innovate in a way that government doesn’t necessarily have the capacity to do, but that government partnership is imperative for the sustainability and scalability of early literacy initiatives. Delegates working in the NPO sector cited international studies that demonstrate how early childhood development (ECD) positively impacts the economy, environment and society in the long-term, and discussed the need for similar local longitudinal studies. “People who aren’t literate won’t be able to participate in the economy fully and effectively. Those struggling to make ends meet do not always have the luxury to consider the impact of climate change, for example. Reading exposes people to different ways of being and impacts their ability to have empathy towards those who are different to them,” said a delegate. Companies that support education should consider investing in research into the economic impact of ECD. Companies supporting ECD and foundation phase literacy initiatives must play a collaborative facilitation role by bringing their various implementing partners together to share insights, lessons and strategies for creating lasting impact. Companies can help to facilitate the establishment of intermediary groups of education stakeholders that lobby government to sustain and scale best practice projects. To this end, implementing partners must be supported to design cost-effective projects that can be taken to scale by government. VWSA has been on a journey since 2015 to ensure that children are functionally literate by the end of grade three. The company’s approach to this focus area has expanded from the recognition that literacy is the cornerstone of quality education and the gateway to numerical competency, to advocating for the support of literacy as a social justice imperative. VWSA invests in early language development and functional literacy at foundation phase, at five primary schools in Uitenhage. The company did a baseline study of the schools which found that only 20% of children in the target age group could read for meaning, reflecting the 2016 PIRLS results on national literacy. 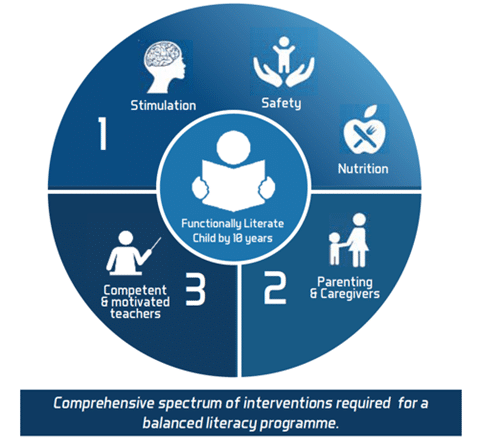 In collaboration with implementing partners, VWSA’s comprehensive literacy programme encompasses a spectrum of interventions that address the broader environment in which children grow up and learn to read. The programme equips learners with the resources necessary to be able to read with meaning and equips teachers, parents and caregivers with the skills needed to support their children in the classroom and at home. VWSA envisages these interventions as long term one, spanning at least 10 to 20 years. VWSA partners with Shine Literacy to provide individual support to children in grades two and three who are at risk of falling behind in their schooling. Children are paired with trained volunteers who support their learning weekly, for at least a year. Shine ensures that classrooms are equipped with multicultural and age-appropriate storybooks to promote a school culture of reading. A ‘paired and shared’ approach also ensures that younger children receive help and mentorship from older learners at their schools with whom they are partnered. Edufundi focuses on improving the quality of teaching at primary school level. The Edufundi team visits primary schools to provide sustained mentorship and support for teachers in their own classrooms. Through the Teach-Like-a-Champion programme, teachers are supported and mentored on a weekly basis, enabling them to manage their classrooms better, plan lessons, engage and motivate their learners. Shine Literacy Family Workshops equip parents and caregivers with the knowledge and skills to help them support learning in the home. Parents are taught to value their existing knowledge and are encouraged to embrace their vital role in their children’s education. The workshops provide tips, practical ideas and new resources for making learning in the home fun and enjoyable. Nal’iBali is a national reading-for-enjoyment campaign to spark children’s potential through storytelling and reading. The organisation distributes bilingual supplements that provide children with access to free and relevant reading material that will inspire a lifelong love of reading. The organisation also mobilises and supports a network of literacy activists to establish and run reading clubs at schools and in the broader communities and host home libraries. Children need access to adequate nutrition and sanitation in order to learn. The culture of reading begins at home. Parents are the primary educators before children enter school and yet only 30% to 40% of parents read to their children, with these rates decreasing in rural areas, where less than 10% of homes have books. Few homes are adequately resourced and capacitated to provide early childhood and ongoing literacy learning opportunities. Parents’ roles in their children’s literacy learning and broader education must be underscored. Most public schools do not have libraries or the necessary literary resources to inspire a culture of reading for pleasure among their learners. Often, the reading material that is available is not age-appropriate or written in the children’s home language. School and home environments must be supported with cost effective, appropriate and relevant reading material. Current classroom conditions and pedagogical strategies do not appear to be effective in achieving required levels of literacy. Teachers must be trained to identify gaps in their learners’ literacy development and use relevant reading material effectively. Teachers must be (up)skilled to become expert and passionate reading instructors who can cultivate a love of reading among their learners. Teachers are often constrained by excessive numbers of students, limiting the extent to which they are able to stratify the abilities of their learners and give them individual attention. VW has found that the most successful of its interventions are those that target the children directly. In theory, the need to build teacher capacity should be a priority; however, VW’s experience has been that interventions that go through the teachers are not as successful as those that target the children directly. 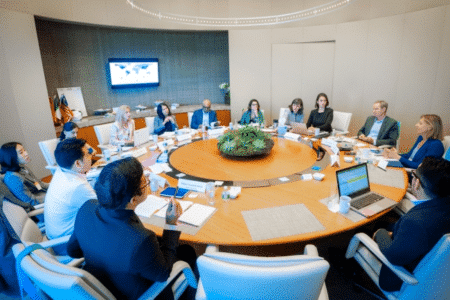 Collaboration with a wide network of funders and implementing partners is critical to eradicate potential duplication of efforts and to ensure the best possible outcomes. Interventions with multiple implementing partners should be streamlined and present a united front to beneficiaries. Funders should prevent multiple service providers from entering schools under their own brand names, with their own methodologies and practices. This can be tiring for teachers to manage and lead to confusion for the beneficiaries. Monitoring and evaluation (M&E) of literacy interventions must be built into programming from the beginning and common M&E tools should be adopted. Establishing a baseline at the beginning of the programme has been essential in VWSA’s ability to track the programme’s success. In addition to supporting the advocacy and implementation of functional literacy at foundation phase, companies can also foster an internal culture that promotes reading for pleasure by establishing staff libraries, especially since many employees are parents who can in turn nurture a reading culture in their homes. Companies can also encourage employee volunteerism that supports community literacy projects.